Why are good release notes so hard to come by? Why are they so rare that I take a screenshot when I do come by one that manages to be readable and fun? Possibly because not everyone has caught onto the hidden value of writing really great release notes. It’s the only thing that can explain why teams at companies like Slack and Citymapper are elevating the release note into an art form, while others just write up half-assed notes. But you don’t have to make your release notes a work of art to take advantage of a great engagement opportunity. Just write better release notes. Release notes aren’t necessarily read by everyone, but the people who do read them matter. That’s because those who do pay attention to release notes are very vocal about how their experiences hasn’t matched up to their expectations. On the flip side, they tend to give high praise for a job well done. You may think users aren’t sitting there waiting for updates, but you may be surprised by how the most minor changes and details actually provide a unique experience to your product – and people are noticing. They may even be willing to provide you with feedback if only you would tell them what it is you’ve released. In this ironic screenshot, LinkedIn doesn’t connect to people or opportunity. It just sits there, using words to communicate nothing. ‘Bug fixes and performance improvements’ is completely meaningless. What was fixed? How will performance improve? Where along the user experience can we expect improvements? A missed opportunity to say the least. Good release notes are written to be read, clearly outlining what has been improved and how they benefit the users. 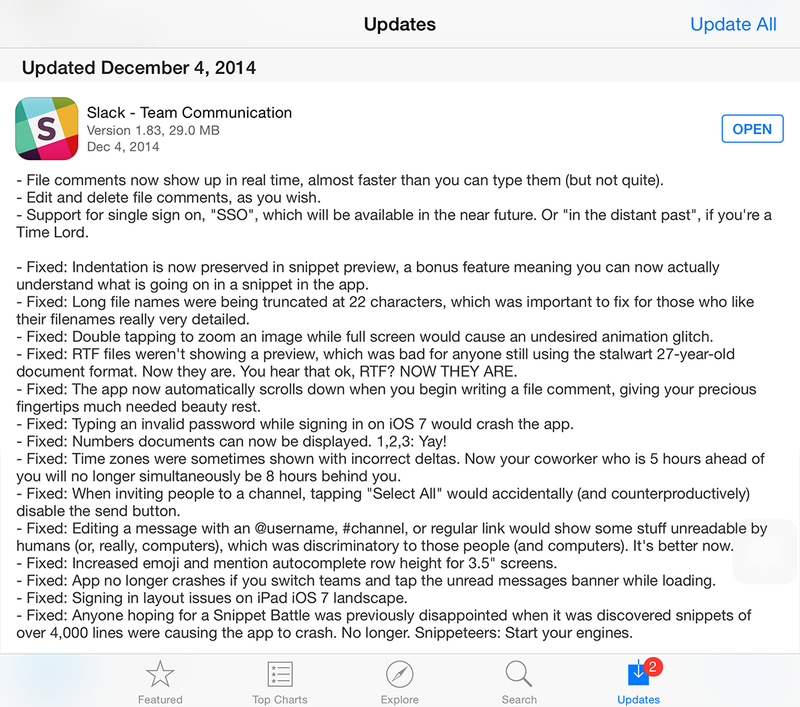 I find release notes easier to digest when they’re divided into sections. Sections make for easier scanning for users, but they’ve also helped me organize myself while I write. Writing clear, specific release notes help you open up a level of communication with your customers around the progress you’re making on your product. It’s useful for potential customers too. We’ve been asked before whether we publish release notes – probably because it’s a good indicator of whether we’re delivering what we promised on our roadmap. It’s no secret that we’re a fan of public product roadmaps, and we encourage making your release notes public because they bring you the same benefits. At ProdPad, I make sure ours are accessible from all our major touch points, including our app, our Help Center, our internal Slack, as well as the Slack community we’ve set up for our customers. Customers love that commitment to transparency – it gives them a reason to trust you. Our release notes tend to be specific and benefit-driven too, which shows customers we’re writing for them. As a result, they come talk to us, which is exactly what we want! Slack’s release notes are wonderful. Notes like this don’t just happen. Slack points out that their whimsical-but-practical technical writing style doesn’t come easy for all their dev teams. As a result, they put all each one through a review process with an editor who checks for style, accuracy and readability. “In 2015 Medium delivered updates to its app via a country ballad, a series of haiku, a eulogy, Kenny Loggins song titles, and a faux Slack conversation,” reports Verge editor, Casey Newton. Medium gets to be fun and experimental because it’s a reflection of their brand, their purpose and the people who make up their organization. In fact, when Newton was invited to Medium’s HQ for beers and release note writing, he found that the work was largely the product of two employees, Nick Fisher, Medium’s community manager, and Greg Gueldner, a member of the company’s trust and safety team. Medium takes advantage of its own medium as a storytelling platform to explore new, offbeat ways to communicate their new releases. What would your brand do? Andrea is a Product Support and Management expert, technical writer, and social network monkey. An undercover geek with a passion for music, animals, and avid unicorn rights activist, she's always up for a challenge. Great post, Andrea. 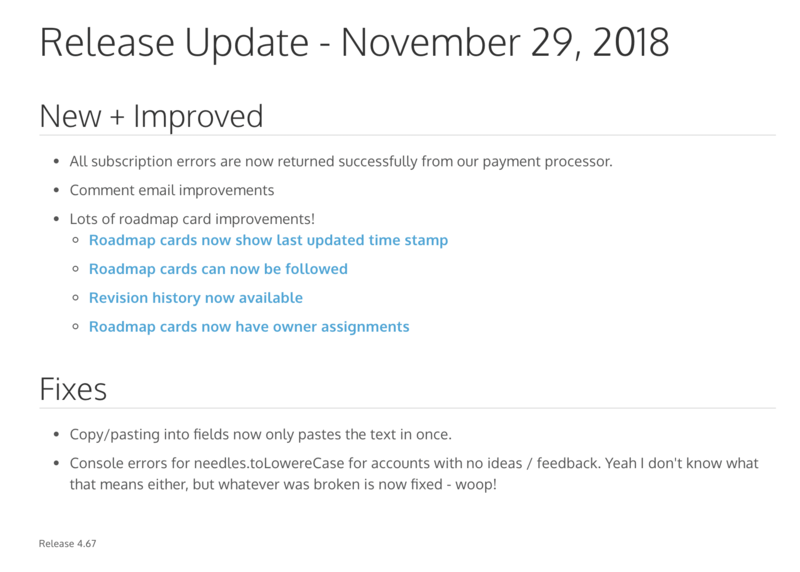 I’ve been following the release notes of Slack in particular because they’re awesome, and they did a nice blog post on theirs as well (https://slackhq.com/a-little-thing-about-release-notes-997d2e06842d#.eyo5397i3), but I like your template even more. Also, super important mention of brand at the end there… here at Sight Machine I don’t think we could get away with being so cute/light-hearted/whimsical (tell me if you disagree). We need to appear a bit more serious… but there’s still room to reflect our brand in the style and make it worth someone’s time to read. Glad you liked the blog post! And I totally agree – not everyone can necessarily get away with being funny, but if you can, why not? At the very least they should be clear, concise, and in simple language everyone can understand. There are still ways to push through the brand personality without the funny bits, but I still think the most important aspect is to make them comprehensible and easy to read.